TRENCH is a user friendly, affordable, and versatile software program that evaluates the stability of slurry supported trenches and panels for 2D and 3D analyses. With TRENCH analyze in a few minutes what would take hours to do by hand. Trench offers a number of user friendly features that simplify the evaluation of safety factors of slurry supported trenches and panels. 2D and 3D wedge stability computations of slurry filled trenches and panels. Active pressure or wedge search methods available for 2D analysis. Define multiple soil profiles for comparison. 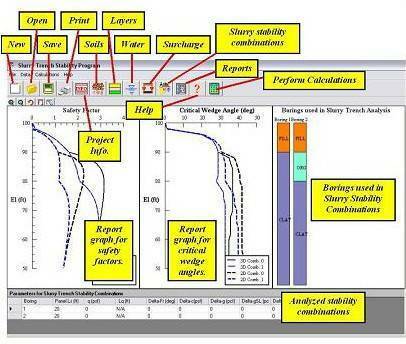 Custom surcharge patterns to simulate crane loadings. Easily perform parametric studies varying any combination of soil strength, groundwater, slurry density etc. Comprehensive user friendly output and input reports. * Trench download link provides trial version of the software. No one has rated Trench yet. Be the first to rate this product.